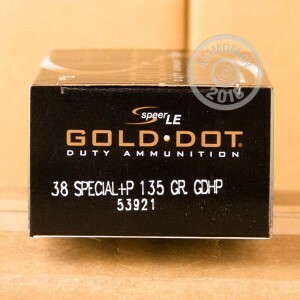 Looking to stock up on Speer Gold Dot self defense rounds for your 38 Special? You have come to the right place! 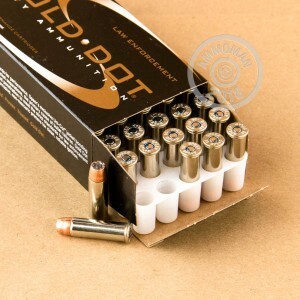 Speer Gold Dot self defense rounds are some of the most popular and effective JHP rounds on the market. They were designed to have optimal performance, even when fired through intermediate barriers like clothing. These rounds have a 135 grain jacketed hollow point round, loaded to P+ pressures. Make sure that your handgun can withstand the increased pressure associated with firing P+ ammunition. If you handgun is made for it, then the P+ ammunition will have some of the best on target ballistics available. Each round is reloadable, nickel-plated brass cased, Boxer-primed, and non corrosive. Stock up on as much of this great ammo while we still have it. You never know when you might need it. Speer ammunition is highly regarded in the shooting community; they have several lines of accurate and quality range and self defense ammunition. Speer Lawman is the line of range training ammunition that pairs well with the Gold Dot line of ammunition.